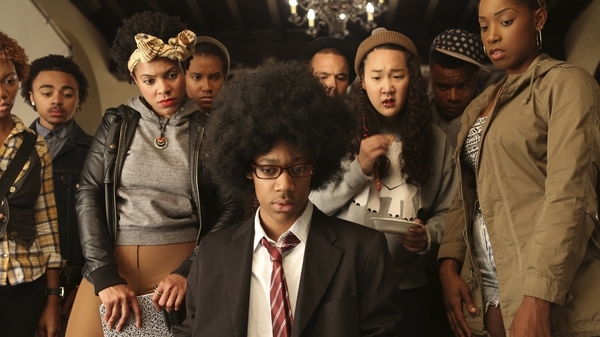 The diversification of an all-black residence hall forces a group of African-American university students to take a stand in Justin Simien’s funny, inventive and provocatively tongue-in-cheek, razor-sharp social satire of racial politics. Trouble is brewing at the elite and prestigious Ivy League Winchester College and Sam White (Tessa Thompson) is frustrated. Everywhere she looks, she finds racial inequality and coded aggression. A self-styled militant activist determined to shake up Winchester’s predominantly white student body, her radio show is rubbing people up the wrong way and her ex-boyfriend, the tormented son of the school’s dean, is her opponent in a student election campaign she thinks she will never win. But when she does, Sam is forced to face the true complexity of the racial politics she espouses and is forced to reassess where she belongs in an allegedly ‘post-racial’ Obama nation. A huge word of mouth hit at both the Sundance and London film festivals, this brilliant debut pushes plenty of buttons and is a fresh, comic look at a serious issue that runs deep; playing like a sort of elite microcosm of present-day race relations that amid the laughs asks some hard questions without presuming to know any of the answers.